The NEW! Dinosaur Learning Activity Book is now available! Written and illustrated by paleontologist Geoff Habiger, and Published by Artemesia Publishing, the Dinosaur Learning Activity Book contains 80 pages of pictures to color, activities, and scientifically accurate information about dinosaurs, dinosaur skeletons, geologic time, and why certain extinct animals are not really dinosaurs, even though they are commonly mistaken for dinosaurs. 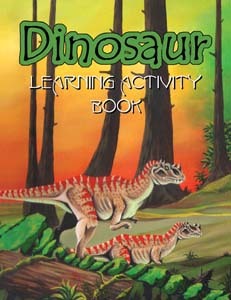 The Dinosaur Learning Activity Book is appropriate for children and paleontologists of all ages. Activities include a cross word puzzle, word search, matching activities, and dinosaur definitions which can be used in a classroom setting, home schooling, or just for fun. A glossary in the back gives the names of dinosaurs and non-dinosaurs featured in the activity book, a guide to the pronunciation of their names, and what the names mean. All coloring pages include information about when the animals shown lived and where their fossils are found. Educators and librarians, please inquire about discounts for ordering in quantity. "A cute, simple, and fun way to learn what paleontologists do. I highly recommend this book to parents and their young grade-schoolers." "Finally, a dinosaur book for children written by someone with a background in paleontology! Kids will have hours of fun and absorb current and accurate information about the ancient world at the same time. The Dinosaur Learning Activity Book is win-win!" "Great information, fun activities and DINOSAURS! It is so cool to see a book like this that is not out dated or full of mis-information." "A valuable and fun resource to introduce children to many aspects of dinosaur science." "Mr. Habiger has created an exciting activity book packed with information. The best part of this book is that it provides not just the same information found in other books; instead there is a great deal of effort to show how paleontologists discover that information and use it."